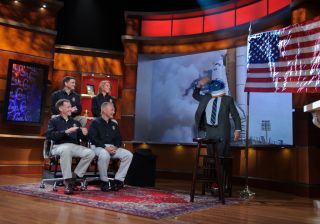 Stephen Colbert, host of The Colbert Report, salutes the crew of STS-135, seated from lower left, Commander Chris Ferguson, Pilot Doug Hurley, Mission Specialists Sandy Magnus and Rex Walheim, during their appearance for a taping of his television show, Tuesday evening Aug. 16, 2011, in New York. This story was updated at 1:20 p.m. EDT. NEW YORK — Houston, Stephen Colbert is a space nut … even the astronauts think so. The four astronauts who flew on NASA's last space shuttle mission in July gave the TV comedian one of the actual nuts that kept their rocket ship on the launch pad during an appearance Tuesday (Aug. 16) on Colbert's late-night show "The Colbert Report." The special gift capped a laugh-filled chat between Colbert and the astronauts about NASA's final shuttle flight and the future of spaceflight. Never one to miss a beat, Colbert joked about the apt name of his new souvenir. "As if launching a rocket were not phallic enough, you literally bust a nut when you go into space," he said. Atlantis launched on a 13-day voyage to the International Space Station in July. The mission was the 135th and final flight of NASA's 30-year space shuttle program. Colbert welcomed the astronauts on his show by donning a plastic spacesuit helmet and saluting them next to an American flag. He then asked Ferguson and his crewmates, pilot Doug Hurley and mission specialists Rex Walheim and Sandra Magnus, whether being an astronaut was a childhood dream. "I watched Neil Armstrong walk on the moon and from that moment forward, there was a little bit of a glimmer there," Ferguson said. "Started flying airplanes, and further on down the line, kind of made a marriage of the two and ended up becoming an astronaut. It was really spectacular." "Now that the shuttle mission is done," Colbert continued, "what do you dream of growing up to become?" The question brought out chuckles in the four-astronaut crew, and Magnus admitted that was a difficult question. The veteran spaceflyers then spoke about Atlantis' final launch and landing, and Walheim recounted what it was like to be the last person to climb onboard the shuttle before it lifted off. "I got to climb in last, so I was the last one to board the vehicle, which was kind of fun, because these guys were all sitting on their backs, kind of uncomfortable, and I got to stay on the launch pad and walk around and look at the ocean," Walheim said. "And then it was my turn to go in and I got to cross the gantry for the last time and climb onboard the vehicle." Ferguson said that landing Atlantis for the final time was a very difficult and moving experience. "A lot of folks said,' well what will it feel like? What's it going to be like when it's all over?'" he said. "And I said, well I'll let you know when it's all over. And I'll tell you, when it was all over, it was an emotional moment. It was tough for us to get out of the orbiter, knowing that there would be nobody else to follow in our footsteps in a space shuttle." Now that NASA's orbiter fleet has officially been retired, the astronauts also spoke about the agency's future in human spaceflight. "Instead of having NASA sponsor the space business, we'll probably have the equivalent of a commercial space alliance," Ferguson explained. "In the interim, in the intervening four or five years, we're going to buy seats from the Russians, so we're going to get back and forth on a Russian spacecraft." When told that seats on Russian-built Soyuz spaceships cost about $63 million, Colbert offered a cheaper alternative. "Have we tried Priceline?" he said, referencing the discount online travel-planning service that is endorsed by Star Trek actor William Shatner. "I mean, for the love of God, it's William Shatner, Captain Kirk, he should be able to get us a better price." The Colbert Report was one of several stops for the astronauts on their three-day tour of New York City. Yesterday (Aug. 16), Ferguson and his crewmates, pilot Doug Hurley and mission specialists Rex Walheim and Sandra Magnus, dropped by CNN before visiting Manhattan's American Museum of Natural History to speak before a crowd of hundreds. Today, the crew joined Sesame Street's Elmo at the Eventi Plaza for a free public event, and on Thursday (Aug. 18), the spaceflyers will visit the Intrepid Sea-Air-Space Museum to tour the facility where the test shuttle Enterprise will ultimately be put on display. Colbert is also the namesake of an exercise treadmill flying 220 miles (354 kilometers) above Earth onboard the International Space Station. Officially called the Combined Operational Load-Bearing External Resistance Treadmill (or COLBERT), the $5 million piece of exercise hardware got its name as a consolation prize for the popular TV comedian, who won an online NASA contest for the naming rights to a new space station module in 2009.